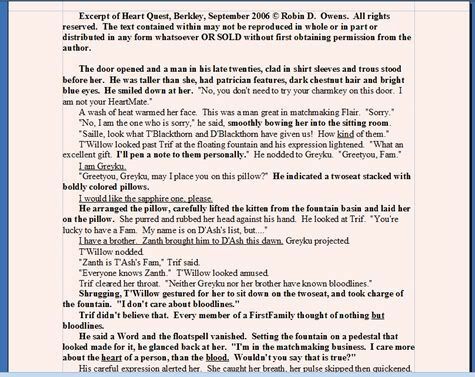 Thought I'd put up this teeney excerpt while few folks were watching...Anyway, it's time I work on some scene polishing, which means adding more description in Heart Match. This is the description of Saille T'Willow and his home that appear in Heart Quest (and dammit, I put a door in the wrong place, but no one will know but me...most readers, to my delight, don't pick up on such minor details). Now that Saille is my hero, I need to make sure the description and choreography is right from Heart Quest and expand upon it to show him in his own. I've excerpted this scene to my own files and bolded the things I need to remember. If I were really organized, I might change the colors for description, motivation, actions and/or events that occurred, but all is just in black. May all your choreography work today.